Your piece of heaven awaits you on this secluded 25 acre estate adorned with a 5BR, 4.5BA custom built home w/ guest suite above the garage, heated in-ground pool, two acre pond with dock, very high efficiency geothermal heating system, chicken coop, fenced pasture & four-stall barn. This elegant home offers a formal living & dining room w/ butler&apos;s pantry & chef&apos;s gourmet kitchen complete w/ a Wolf 6-burner gas stove. The kitchen is open to the family room w/ a gas logs fireplace and access to a covered balcony, perfect for evening cookouts. Enjoy luxury & convenience throughout this home w/ an abundance of storage, a mudroom on main level as well as basement, gorgeous marble double sink vanities in bathrooms, built-in sauna, wet bar, media room & finished attic that would make an ideal office, playroom or storage for the important memories of your life. 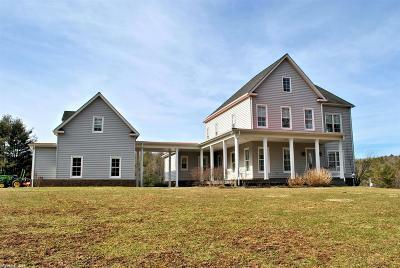 This beautiful home is only 15 min from downtown Floyd & 20 min from I-77 in Hillsville. A treasure to be had in Floyd County! Directions: From Route 8/Downtown Floyd, Take Rt. 221s Toward Willis. Go Approximately 12.5 Miles And Turn Right On Dusty Mile Rd. At Fork Stay To The Right And Follow Driveway To Second Fork Then Stay To The Left. See Signs.